With foliage that release a pleasant ‘mint like’ aroma when brushed as you walk past this is a good plant for a sensory garden. 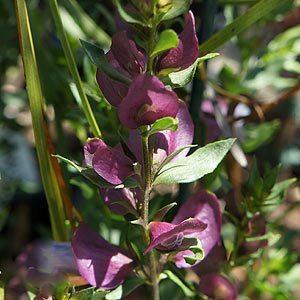 One ofmthe more popular species is Prostanthera incisa, The Cut Leaf Mint Bush, with attractive mauve to purple flowers it seems easy to grow in a well drained soil. 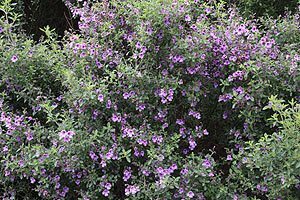 With over 90 species the popular Prostanthera ovalifolia is found in NSW and QLD and is the ‘Oval Leafed Mint Bush’ it will grow to 2.5m and with nice pink to purple flowers is widely used. P. magnifica is from Western Australia and is a large flowering mint bush with deep red flowers, grafted plants may be best. P. rotundifolia is common in New South Wales, Queensland, Tasmania, Victoria and like all Mint Bush requires a well drained soil. Commonly called the round leafed mint bush. P. cuneatra is a compact form, a small green leaved shrub with aromatic foliage and white flowers. P. aspalathoides is the red flowering mint bush found from Victoria through to South Australia. All species are easy care in a well drained humus rich soil. They all require good drainage, however some moisture is also essential for good growth. Best in full sun to dappled shade in the afternoon. In a sensory garden amongst other perfumed foliage plants or in the garden border as a filler. Also works well in native garden mixed plantings. Widely used in sensory gardens where the fragrance of the foliage when brushed fills the air.